First Peoples was Bedford/St. Martin’s first “docutext” – a textbook that features groups of primary source documents at the end of each chapter, essentially providing a reader in addition to the narrative textbook. Expertly authored by Colin G. Calloway, First Peoples has been praised for its inclusion of Native American sources and Calloway’s concerted effort to weave Native perspectives throughout the narrative. 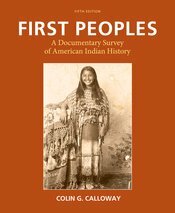 First Peoples’ distinctive approach continues to make it the bestselling and most highly acclaimed text for the American Indian history survey. To give you more options for sources, we are offering five projects from the Bedford Digital Collections, bundled free with the purchase of a new text. This online repository of discovery-oriented projects offers both fresh and canonical sources ready to assign. Each curated project poses a historical question and guides students step by step through analysis of primary sources. Sand Creek: Battle or Massacre?